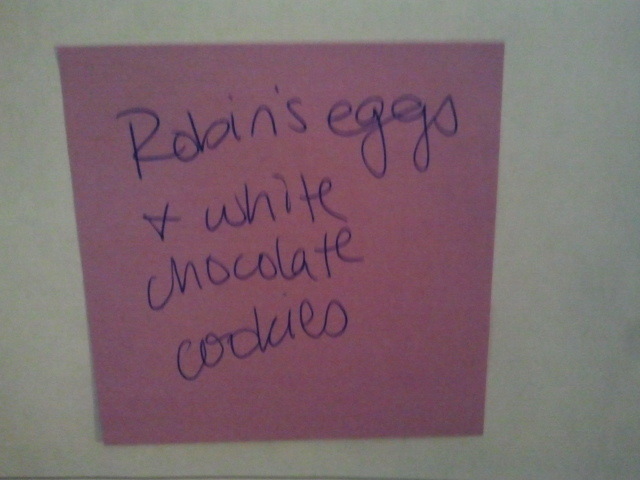 On Monday, Brenna brought Easter to our office in the form of Robin’s Egg Cookies! With Easter this weekend, I think these would be a nice addition to the dessert table. I have to tell you, when I first saw her post-in note, I was completely confused. And possibly slightly outraged. “You used robin’s eggs for cookies?! You killed baby birds for these?” Thankfully, Brenna follows my crazy brain quite well and totally played me. “Of course! Why wouldn’t I?” At my horrified expression, she giggled and told me the truth, “No! 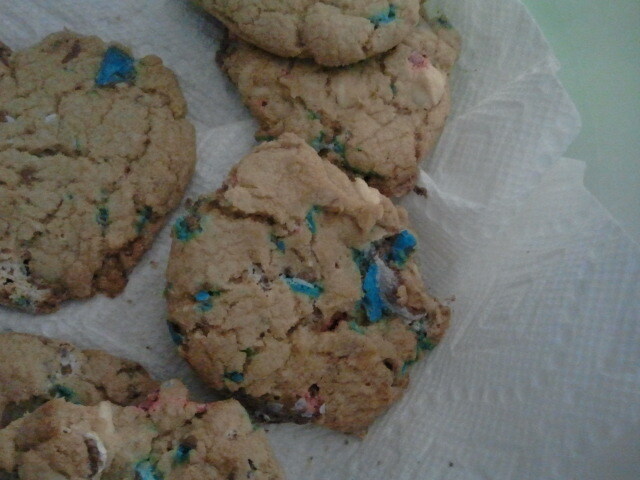 I used the candy eggs. You know, the little malt candy?” Oh. Right. I should totally have my coffee before I talk in the morning. Regardless of my initial reaction, I took one of these beauties and then a second one later in the day. Mostly I ate them because I like to write about what she bakes but maybe just a little because I like to EAT what she bakes! These were a little chunky and the first was a little crunchy for me but overall they were pretty tasty. The eggs add more malt to the cookie than the Malted Chocolate Chip Cookies she made before and I really like that taste in cookies. Brenna said she wasn’t as sold on this particular cookie recipe since it required that she use dough balls instead of just dropping it. If she makes them again, she said she’d try it with her favorite chocolate chip cookie recipe, replacing the semi-sweet chocolate for white chocolate and adding in the robin’s eggs. Posted on April 17, 2014, in Brenna Bakes and tagged baking, Brenna, Brenna Bakes, Chocolate Chip Cookies, Cookies, happiness, malted chocolate chip cookies, Robin's Egg Cookies, robin's eggs. Bookmark the permalink. Leave a comment.